cdcindonesia.com - The morning spirit of all job seekers, here is the job vacancy information coming from one of the companies engaged in the construction field, namely:PT Indra Karya (Persero) - PT IKA or known as Indra Karya is a long standing state-owned company in Indonesia, running business in engineering consulting services. 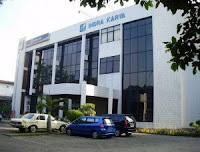 PT Indra Karya (Persero) was established in 1972 as a continuation of PN Indra Karya and initially started as general construction company. Because the company continues to suffer losses, then in 1978 the Company transformed into engineering consulting services company. As today, PT Indra Karya (Persero) has strong business competencies on engineering consulting services, including water resources development, electricity resources development, transportation infrastructure, survey and investigation, building, and environment. Fresh Graduate or maximum 2 years of experience in the related field. Minimum GPA of 3.25 for PTN and 3.35 for PTS. Preferably education background in accordance with Education / Expertise and graduated from reputable university (PTN/PTS) with accreditation "A". Have motivation, energetic, adaptive and able to cooperate in teams. Willing to sign placements in all parts of Indonesia. Closing date 10 August 2018.All applications are appreciated and will be treated confidentially. Only qualified, short-listed applicants will be invited for furthers process.